Eight Tibetan students of the Sorig Lobling medical school in Chabcha, eastern Tibet have been sentenced to five years in prison even as the school continues to remain under strict surveillance for the third straight week. The eight students have been identified as Rabten, Wangdue Tsering, Jampa Tsering, Choekyong, Tashi Kunsang, Dola Tsering, Sangye Dhondup, and Kunsang Bum. Speaking to Phayul, Shawo Dorjee, a Tibetan living in Switzerland said that all those sentenced were below 23 years of age. “The students were sentenced on December 5 on charges of their involvement in the students’ mass protest in Chabcha on November 26,” Dorjee said citing sources in the region. It is not known where the students have been jailed. 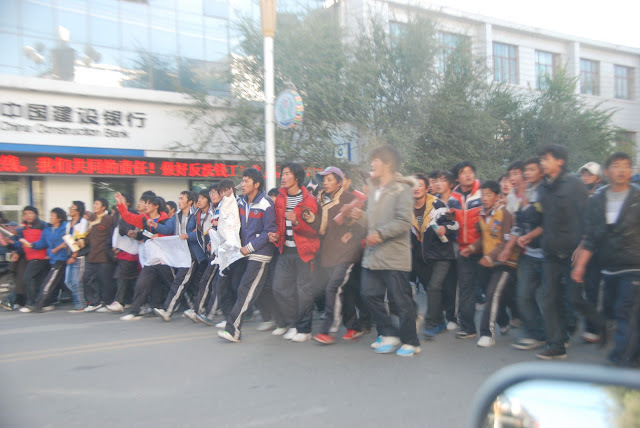 On November 26, over a thousand Tibetan students from the Chabcha Sorig Lobling School staged a major protest rally against the Chinese government, raising slogans calling for freedom, equality of nationalities, freedom of language, respect for truth, and re-establishment of governance. Chinese armed forces used violent force to break up the demonstration, injuring many young protesters and hospitalising around 20 students. The school was subsequently placed under complete lock down and Chinese security forces barred students from meeting their parents and relatives. The next day, three of the medical school’s students, Wangchen Tsering of Ba County, Mama and an identified student were arrested in connection with the protest. At the beginning of this month, three Tibetan monks of the Chamru Monastery, identified as Sungrab Gyatso, Dragsang, and Yeshe Sangpo were arrested for their reported role in sending out information on the protest. According to earlier reports, arrested students were interrogated, tortured, and barred from having any visitors. The protest were triggered after local Chinese authorities distributed a ten-point political questionnaire to the students, critical of the self-immolation protests in Tibet and gave “patriotic education” sessions that contained disparaging remarks against His Holiness the Dalai Lama.